Discussion in 'Audio Hardware' started by Danny Holland, Jan 20, 2014. I tend to set antiskate by ear. Listen for balanced channels (you need good hearing in both ears for this so get the wax cleared). Also do fine adjustments to see how this affects the sound balance. I find with the modified Rega I use that sound is more 'open' with ant-skate set quite a bit lower than the playing weight. This will vary according to arm. Would agree in using a test disc if you are not competent or inexperienced with the particular arm used. As mentioned before putting the stylus on the dead wax is of no use. However the stylus should catch the last run out groove and not skate over the label. There appears to be a general problem with anti- skate on Hanpin arms judging from posts about the AT and Pioneer tables. I basically agree. But there is always a but......Lets take my combo as an example. That is, the turntable equipped with the AT120E cartridge. This combination is so good, most visitors listening to this combination are astonished all this quality comes at such a low price. Of course, it is no use to compare this turntable with a Goldmund or whatever other exotic turntable. To enjoy records you don't have to spend a fortune on gear. Just make sure the components are well matched, such is the case here. It is affordable, has built-in USB facilities, in short, you can't go wrong at all. Adjust it as good as possible, goes for every turntable. In my opinion, this combo is the perfect way to get involved with records. And as one grows into the format, maybe at some point one wants more but I wouldn't be surprised if many people stay perfectly satisfied with this product. Yes, it is THAT good.......so good in fact that you forgive it the minor flaws it has. Because at normal use these flaws won't be audible or cause problems of any kind. One of the minor flaws is the hollow, plastic plinth. So tapping on the deck while playing a record results in loud bangs. But what jerk would do that? Another flaw frequently mentioned is the hum that is audible at loud volumes. It is demonstrated elsewhere on the internet, some idiot cranks up the volume all the way while the turntable plays no record. A very soft hum can be heard, yes. It is obvious this guy has no idea the hum will be totally harmless as groove noise with ANY record certainly will be a lot louder during normal play. And this groove noise hardly ever is a problem, or the record must be very poorly pressed or the quality of the used vinyl is poor. You get what you pay for, sure. But for the price you can't go wrong. To me those problems are significant but maybe shouldn't complain at the price. Hum especially annoying as reported with Nagaoka cartridges especially - this happens with Sl12oo too but the electronics are neat and power supply can be moved to a separate box with a little knowledge available on some forums. Also I would remove the USB and internal phono stage plus add damping to the plinth. My general advice is spend a little more but not on a more expensive Hanpin design (sorry Pioneer and Onkyo). Sorry to resurrect but I recently contacted AT with this issue. I purchased the silver ATLP120 years ago, and the anti skate did nothing at all. When the same model in glossy black came out, I sold the silver one and purchased the black one (thinking the anti skate would work on it). Same thing though. They're basically telling me if I want a table with working anti skate to purchase the $500 model. The AT-LP120-USB was designed as a DJ turntable. Due to its excellent sound, quality and low cost, audiophiles started using and recommending it as an audiophile turntable. The AT-LP120 was designed with the DJ in mind and has features to meet that need such as being able to reverse the direction of the turntable and robustness for record scratching. According to one manufacturer of high end phono cartridges and tone arms, a somewhat weak anti-skate mechanism might be just right for low-compliance, DJ-oriented cartridges and one of our other competitors even recommends setting anti-skate to zero for DJ use. Therefore, the AT-LP120-USB does not have the same anti-skate adjustments that you would find on a high end (and high cost) audiophile turntable. You may look into the AT-LP5 which is more designed for audiophiles and has a stronger anit-skate. The anti skate does actually work if you run the cart at 0.5 grams, I kid you not. I was doing a needle drop and came up against a section that skipped, I could only get it to play thru by lowering my tracking force to 0.5 grams (for 1 song only). It was then that I found that the anti skate did have a substantial effect at that tracking force and I actually needed to use it. Why don't they advertise that? If the AT LP-120 is designed as an entry level DJ turntable, then the consumer needs to know to make an informed decision. Billy Infinity and 4stringking73 like this. Wonder how the SL-1200 anti skate operates being that the ATLP120 was modeled after it. The SL-1200 antiskate is well engineered and operates very nicely. You just can win these days. I got tired of my Audio Technica antiskate issue and I just purchased on eBay a reloop M4000. What a crock! This thing has the EXACT antiskating issue, and the design is so similar that I don't doubt this is the same made-in-china turntable as the AT but with some exterior modifications. I emailed the seller and said I want to send this overpriced junk back. To add insult to injury, you pay over $100 more for the Reloop and get less; no dust cover, no 45 adapter. Oh, you can buy those separately. I just wanted a decent turntable with Quartz lock and proper antiskating. It doesn't seem to exist in a relatively affordable price range. Try a used Technics direct drive, SL-D202, SL-D205, or a Sony direct drive, even the Hitachi direct drives are well constructed.. Your luck will change! I tried a simple fix for the Anti-skate issue. I used a very small piece of 1/16 inch anti-static white foam (like shipping foam that is wrapped around VGA monitor cable ends), and slid it in-between the small opening where the tone are rotates. The piece I used is so small it is not even visible unless you look down inside the tone arm gap. It provided enough tension that I was able to adjust the anti-skating perfectly. Resourceful to try this and it's working... but keep in mind the skating force at the outside of the record is at its greatest, and on the inside the least. So, any anti-skate must apply MORE anti-skate at the outside of the record. If set at 2/3 distance from the edge on a blank record, this would be your best compromise. Many test records have the skating test at that point. I bought an LP-120 several years ago but I mainly got it to play 78's. However, I really don't have that many 78's to play so it doesn't get used for it like I thought it would. Either way, I also never noticed an issue with anti-skate either. I've used the deck for standard records and it seems fine to me. I have an AT-120 cart on it. Audio Technica has been very accommodating when I needed a replacement arm-rest lock lever and rubber lid bumper. They sent me about 6 rubber bumpers. Figured I would share some information about the fix. The spring is available from Audio-Technica. The part number is 102481156 and costs $1. Shipping is $5. I first tried shortening the original spring before finding the part number. 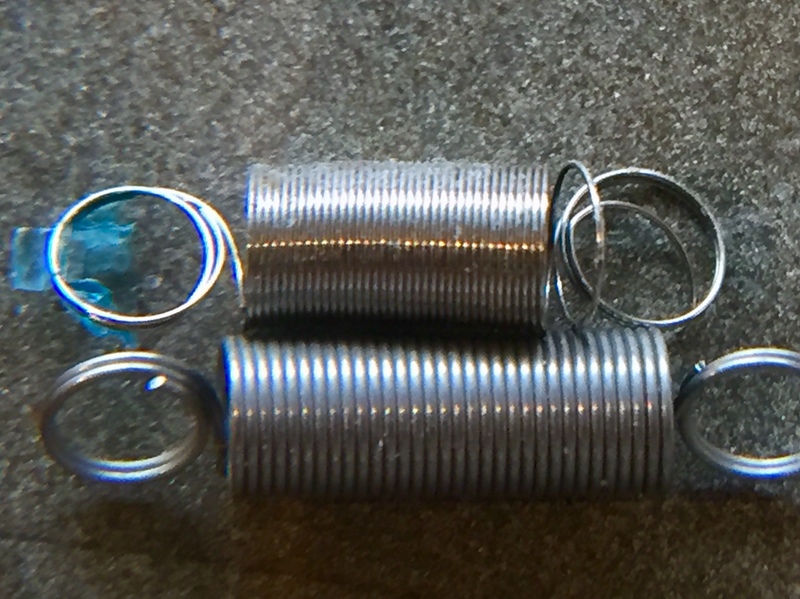 The original spring wire gauge is 0.0056", the new spring is approximately 0.0095"; I did not want to destroy the spring just to get a measurement with my micrometer. Also, removing the pre-amp is well worth the effort - sounds much better. Hopefully this will be beneficial to somebody. vwestlife, nosliw, patient_ot and 1 other person like this. Where on the Audio-Technica site did you find it. I did a search and it says no product found. I sent an email to parts@atus.com asking for the part including the specific part number. nosliw and Leonthepro like this. Dale, thanks for the info re: anti-skate spring. I've just ordered one from Audio-Technica and am planning to install it. I've been looking around online, but can't find any instructions on how to do it. Can you describe the process and/or provide photos? Any help would be much appreciated. I'd like to know this myself. If it's a relatively easy fix then I will give it a shot. FYI, all AT-LP120 turntables manufactured since the beginning of 2017 have the improved anti-skating spring already installed. If you unscrew the circuit board it's attached to, to give you extra slack, you don't need to unsolder the tonearm wires. It's a bit of a juggle, but it's doable. With the new spring installed, the anti-skating on my LP120 is now spot-on, as tested by "playing" a blank record (in my case, a LaserDisc). Instructions linked above are excellent and may even be the ones I followed. I set antiskate using a laserdisc, too. I have also removed the preamp circuit, too. I was doubtful but after serious investigation I found it still dulls the sound, even in bypass mode. If you have the ability and are changing the spring you may as well remove the preamp too. These were exactly the instructions I followed when I replaced mine last February. HOWEVER, this proceedure is NOT for the faint-of-heart or unexperienced, because if you get halfway there and get stuck, you may not be able to save it. There is a surprising amount of disassembly, but with basic skills and lots of patience, plus the photos this gentleman generously posted, it is very doable.